I'm sure everyone has heard of Nantucket! Nantucket is a small island off the coast of Cape Cod in MA that has a long seafaring history and is in its entirety a National Historic Landmark. 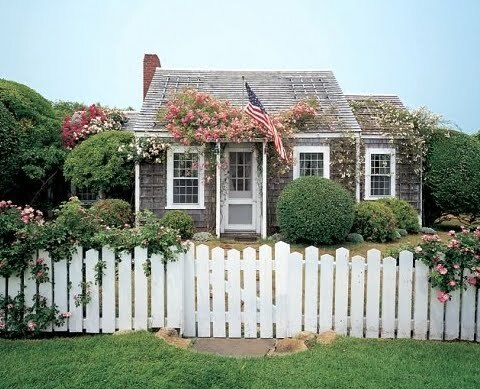 One of many adorable quintessential Nantucket cottages. Via AD. 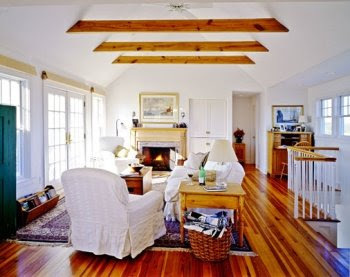 See the living room of this adorable Nantucket cottage below. You will be surprised how modern it is. What is the Nantucket Cottage Decor Style? Let's start with the island's color palette. Sun-bleached whites, cranberry bog reds, seagrass greens, gray blues and sunny yellows. Then choose weathered finishes for a windswept look and furniture pieces that are a reflection of nature outside such as wood, wicker and sisal. Pick decorative accessories that remind of the islands seafaring past, such as Scrimshaw (carved whalebone), Nantucket's woven Lightship Baskets, Ship Models, scaled-down Lighthouses, Wooden Oars, boat cabinets, wood carvings and handwoven textiles from local studios. Furthermore think simple, easy and inexpensive. Slip covers and painted wood floors are common of summer homes there. Step inside the cute cottage seen above, and you find a beautiful simple living room -Nantucket decor with a modern twist. A painted wood floor, sandy colors, natural materials such as rope, and a large world map. All add up to a sea-faring nautical feel. Now old fashioned seafaring style. This Living Room feels rich in history and is absolutely charming. The ceiling is one of the focal points in this Kitchen. 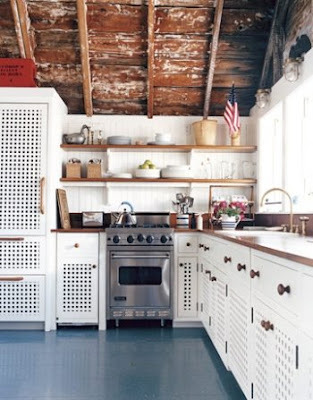 Brass marine light fixtures and Nantucket Style Baskets complete the seafaring cottage look. A casual and bright Living Room with a coffee table that reminds me of a sea captains chest, slipcovered chairs and natural accessories such as a wooden storage bin for magazines and a woven basket. A very sunny Bedroom with a fantastic vaulted wood plank ceiling painted white. And I am sure there is an equally fantastic wood floor hidden underneath the wall to wall carpet. 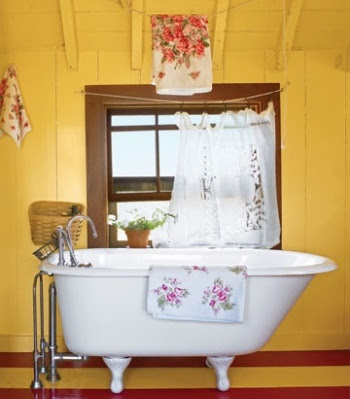 Lastly a wonderful rustic Bathroom and more sunny yellow. Painting the wide-plank floors as mentioned earlier is very Nantucket decor style, and take a closer look at the window treatment, vintage linens clipped onto a line. Simple, easy and inexpensive! 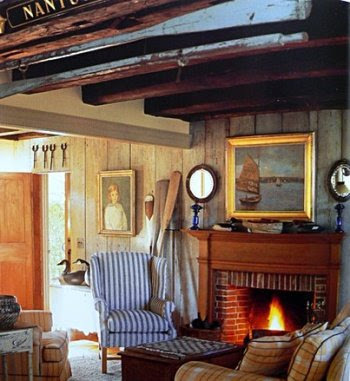 For more on seafaring style, make sure to read this Nautical Decor Guide.